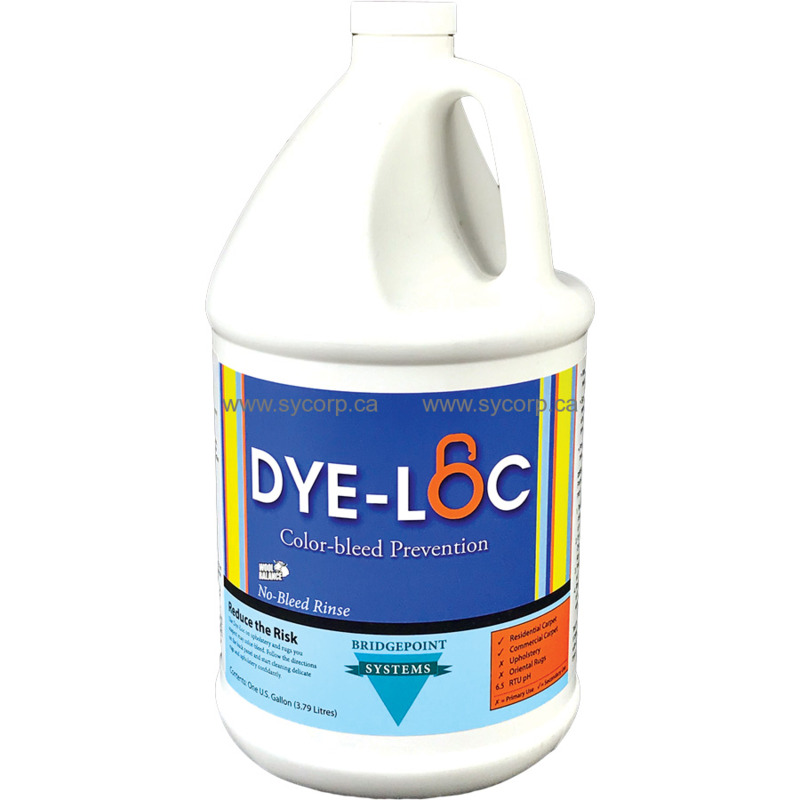 Dye-Loc is a water-based fixing agent for direct and reactive dyes. It significantly improves both washfastness and crockfastness of dyed cellulosic and protein fabrics and their blends. It actually locks fugitive dye-stuff at the molecular level without affecting the light fastness of the dye. Tests show that after one treatment with Dye-Loc, dye-stuff will not easily migrate at future cleanings. Dye-Loc also provides an anti-static quality to the treated textile. Procedure for Cleaning Oriental Rugs that may bleed. Test rug for colorfastness. Pretest procedure below on small section of back of rug before proceeding. If you think rug may bleed, add 3 oz. Dye-Loc per gallon of warm water. Apply with professional sprayer. Prespray rug with Fabric Prespray diluted 1 to 8 with warm water. Rinse and extract with up to 3 ounces of Dye-Loc for each gallon in your rinse water. Test textile (fabric) for colorfastness. If bleeding is not instantaneous, prespray with Bridgepoint Fabric Prespray, agitate, then add 3 oz. Dye-Loc per gallon warm/hot water and extract through machine as normal. Quick dry. If bleeding is instantaneous, prespray fabric with Dye-Loc (3 oz. per gallon warm/hot water). Dry foam application with Bridgepoint Upholstery Shampoo, then agitate with natural sponge. Extract with Dye-Loc as described above.